Planbook PLUS is more than just a plan book. In addition to the basic planning tools you expect, Planbook Plus offers a variety of resources to enrich your daily lesson plans. A library of ready-made lessons, course curricula, a built-in assessment creator and a gradebook take you beyond planning to mastering instruction. It is difficult designing instructional plans to meet the needs of students, while juggling the demands of standards and lack of time. Our feature rich, online lesson planner is the solution. No other lesson planning software allows you to manage your lesson plans as efficiently as Planbook Plus. Create custom lesson element templates for each plan book. Attach teacher and student resources to your plan. Attach any standards to your plans and run coverage reports. Re-use plans from one year to another to save you time. Teachers and students have access to thousands of ready-made lessons, units, courses and assessments as part of our Learning Resources. Lessons are auto-graded and the grades are populated into the integrated gradebook. Attach ready-made lessons to supplement your existing plans. Students log in to complete the online lessons and submit them. Choose how and when to share the lessons with your students. Our print feature allows you to distribute the lessons to your students. Extend your classroom beyond four walls. Share resources and lesson plan elements, assign homework and provide links to online lessons. Share plans with your students, colleagues and administrators. You control exactly what is shared and when. Set-up student accounts to access your planbook and online lessons. Share your planbooks with any Planbook Plus teacher. Extend the classroom and parent communication. You control what you want to share and when it should be shared. Your grade book is automatically populated after setting up your students and rosters. Add your existing lesson plans to the integrated grade book with the click of a button and track online lesson grades as well. Lessons are auto-graded and the results will appear instantly in the grade book. Add your lesson plans to the grade book for monitoring. Students have access to their grades for all lessons. Take control of your assessments. Easily create assessments utilizing our extensive item bank. Take advantage of auto-grading by assigning the assessments online. Quickly create assessments that align with your lesson plans to monitor the progress of students. Search and target specific skills from our assessment wizard. 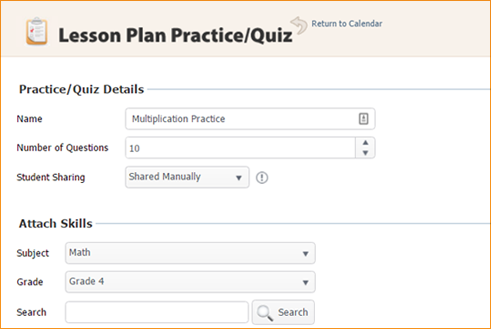 Choose from thousands of grade level questions in multiple subject areas. Online access for students to complete shared assessments. Interested in an INSTRUCTIONAL PLANNING PATH for your district?